I'm going with HBH and saying ACD/Shiba or just ACD/some type of spitz. Here is my ACD/????? cross. We know for certain her mom was purebred ACD. No idea about her daddy. This picture is older, like 4 years ago. I'm not sick of these threads! I like really them, actually. Kelpie x Shiba Inu would be my guess; that or ACD x Shiba. Too cute!! 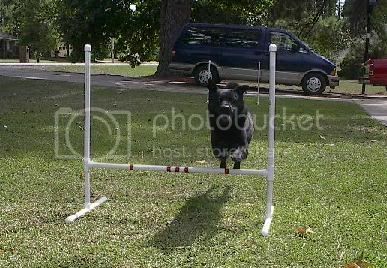 I'd love to get Rudy into agility training, but he's waaaay too clumsy... he'd knock everything over, LOL. I do see a resemblance between them, especially in the snout. So it looks like we almost have a consensus... either Kelpie or Cattle Dog mixed with a Northern breed or Shiba Inu. Sounds like what I've thought! All of those breeds make sense for both his looks and personality, especially with his herding behavior and vocalizations (woo-wooing). I also suspect Cattle Dog more and more lately, since his nose/chin has started to turn gray - he's only 3 years old, so it can't be age-related. The ACD has a distinctive gray speckled snout, and I thought of that when his started to change. Check it out... and sorry about the freaky eyes, LOL. If anyone knows how to avoid that, please tell me! He does have a slight underbite, and often gets his lips stuck to his gums - looks hilarious, like he's sneering at you. I guess we'll see what the DNA test says, but I won't be too upset if they can't figure him out... he is unique, and I love him for that! At least it wasn't that much money, since they only charged me for the original test ($55) plus a $20 upgrade fee. Yeah, I mean, that isn't too expensive, and it will be fun to see the results. I might do it for Fozzie, for kicks. Thanks, and I look forward to meeting the other locals! San Francisco is a fabulous place to be a dog, and a pretty cool place to be human too. Nikki is from SF... and a few others, too. I'm near Sacramento, but I love going to parks/beaches in the bay area. You guys are sooo lucky to have such amazing dog parks! Me and Nikki just met up at Pt Isabel this summer, actually. Ummm ... depends on where you are, U.S. covers a lot of land area. I have met LOTS of Kelpies in the area, actually... and I've seen quite a few who look completely purebred in shelters around here. There are frequently ads in the paper for Kelpies. I wouldn't be surprised, but he could certaintly be part ACD instead, or even in addition! He does look a bit less stocky than an ACD to me. yes and the odds of a kelpie meeting up with a shiba? LOL. Ummm ... odds prolly about the same as an ACD meeting up with a Shiba. Either way, Shibas are pretty popular in SF and the larger surrounding area. ::shrug:: Rudy could be part ACD, but as others have said ACDs are usually stockier and more "meaty" by comparison. Whatever he is breed-wise he certainly is cute!! Yes ... love it but it snowed up here yesterday! Snowed like crazy and it's not even Halloween yet!! I am sooo not ready for winter yet. Yes, we agree on lots and it would be uber cool to someday meet Gonzo the Wonder Dog. Too late for him to meet Cheyenne the Wonder Golden ... she had lots of doggy friends but from your description of Gonzo she woulda loved him. Thanks! Who knows what he is, and honestly I don't care... it's just a puzzle that would be fun to solve. Know what I mean? Still anxiously awaiting the results, so I'll let you all know when they arrive. Oh, and I do see a lot of Shibas around here - one of my neighbors has 3 of them! I used to live in South Lake Tahoe, and it actually snowed on my birthday (Oct. 20th) one year - way cool. I loved it up there, but had to leave for college... tried to move back after I was done, but I couldn't find a job close enough. Oh well, it all worked out for the best! Yeah, why not? It will be fun to find out, if the results are more definitive this time. It is a great place to live! I grew up around here, and never thought I'd stay - nonetheless move to the actual city... but I really love it now, and can't imagine living anywhere else. Anytime you're down here, I'd be happy to show you the good dog parks. Here's another picture I took of him last night... noticed he looked serious in the others, so thought I'd post one of his cute smile. No Spitz, Kelpie or Cattle Dog on there (they do have Shiba)... so the mystery may never be solved, except through the process of elimination. 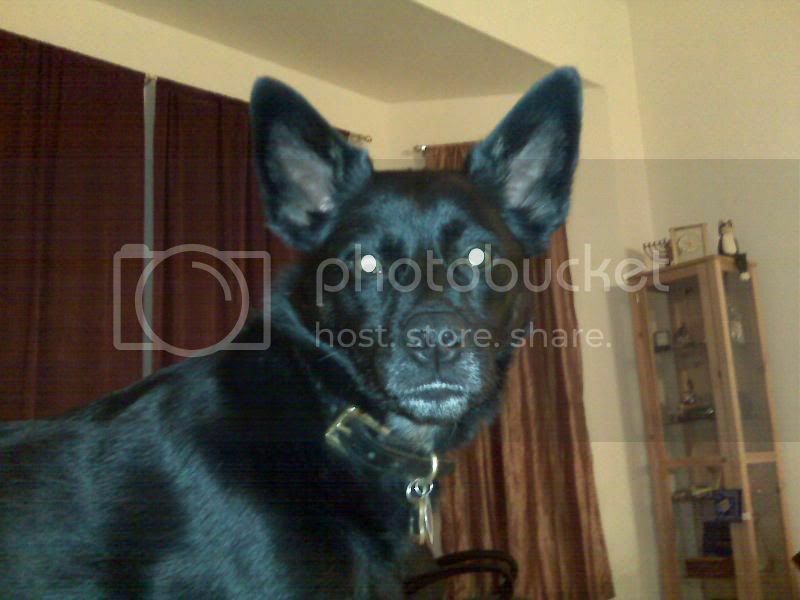 Here is a picture of my old dog. He was chow/husky. He was about 40 pounds. Awww, too cute! He does look like Rudy, and my old vet was convinced he was part Chow... she put Chow/Shepherd mix on his file, and always said he had a "Chow mug." No purple tongue though, LOL. Rudy looks exactly like my dog. I was told by the pound we bought her from that my dog was a Border Collie X Kelpie. However this never quite seemed to match her appearance (Border Collie X Keplies lack the barrel chest, furry collar, slim nose, curled tail [more pronounced when younger] and shorter legs), or her personality. 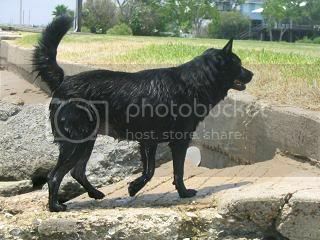 Yesterday it was suggested to me that our dog might be a Belgian breed termed Schipperke (probably X Kelpie). Their nicknames are Little Black Devils, probably because their intelligence, curiosity and strong-will makes them hard to train. 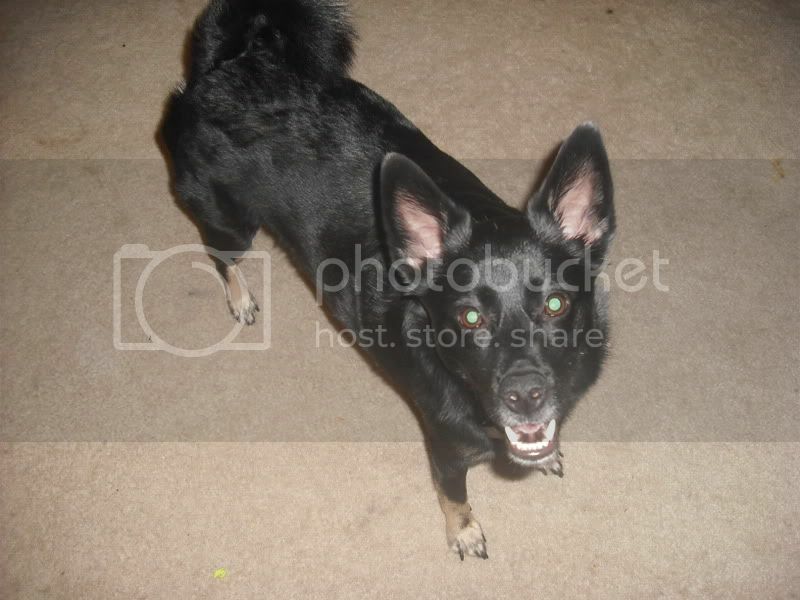 They are very energetic and playful, and peculiarly tend to like the company of people more than other dogs. 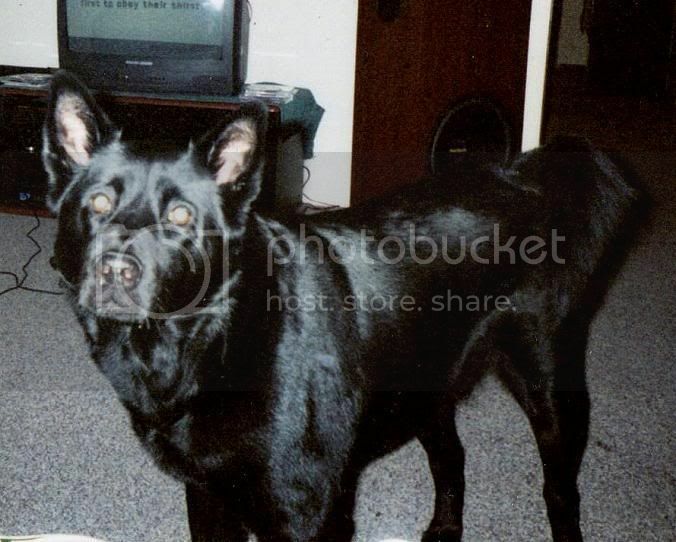 If Schipperkes are not disciplined firmly, they may appear nervous and insecure, because they typically dislike being put in positions of leadership. Do you know what breed Rudy is? If it's not what I suggested, please let me know because I suspect my dog is the exact same breed! Thanks.